Starting in 1540, Spanish and French explorers laid conflicting claims to this area. In 1682, Robert de La Salle claimed all the land drained by the Mississippi River and its tributaries, later called the Louisiana Territory, for France. Spain and France built forts and communities along the Gulf Coast from the [misisprv] to Mississippi. Beginning with an interchange of massacres at small isolated French and Spanish settlements, these events sparked all-out wars and a long murderous rivalry between Spain, France, and Britain for colonial supremacy. This resulted in the infant United States acquiring the Mississippi Territory in 1798, with Natchez as the first territorial capital. Fifty years later, Mississippi suffered the largest percentage dead of any Confederate State in the Civil War. Mississippi was admitted to statehood in December 1817. Called the Magnolia State, Mississippi's 48434 square miles make it the 32nd state in size. 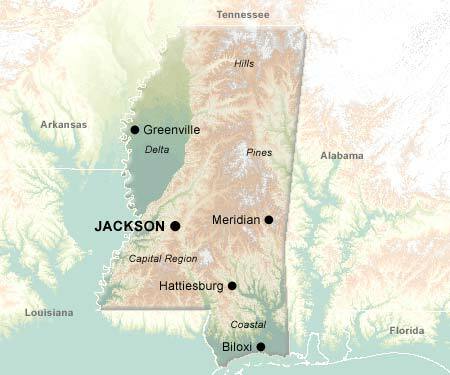 The capital, Jackson, is the largest city. Other large cities are Gulfport and Biloxi. Prominent Mississippians: authors Wm C. Faulkner, Richard Wright, and Tennessee Williams; football players Walter Payton and Jerry Rice; entertainment figures Oprah Winfrey, James Earl Jones, Elvis Presley, Leontyne Price, and Tammy Wynette; and civil rights leader Medgar Evers. S.B. "Sam" Vick of Oakland, played for the New York Yankees and the Boston Red Sox. He was the only man ever to pinch hit for baseball great Babe Ruth. Casey Jones, the famous railroad engineer, died in a crash at Vaughan, while trying to make up for lost time. Mississippi has more churches per capita than any other state. The rarest of North American cranes, the Mississippi Sandhill Crane, lives in the grassy savannas of Jackson County. It stands about 44 inches tall and has an eight-foot wing span.